The following webcam time-lapse show the activity during 2-3 Nov when the weather was unusually clear. There are small explosions and a small tornado next to the cone caused by turbulence between ambient and rising hot air. Sporadic explosions of small to moderate size continue to occur at the summit vent. A pilot observed an ash plume at 22,000 ft (6.7 km) altitude last night. IGPEN reports no significant change in the currently mild, intermittent explosive activity. During the latest 24 hour observation interval, 12 ash explosions were recorded and observed ash plumes rose to about 1 km above the crater. Steam and ash emissions with occasional explosions from the summit vent continue. Yesterday morning, a plume was seen rising about 1 km. IGPEN characterizes activity as moderate to high. Intermittent small to moderate ash explosions continue. Activity remained unchanged at moderate levels with sporadic explosions producing ash plumes up to about 1 km height. Activity has remained unchanged at moderate levels. Weak glow from the summit, intense steaming and few ash explosions occur. Activity (as far as could be observed) has been a bit calmer with less frequent explosions during the past days, but essentially remains unchanged. Seismic activity is at moderate to high levels and a thermal hot spot is visible at the summit. A hot spot continues to be visible at the summit. Activity, both internal and external, remains high, with occasional ash explosions and possibly lava effusion from the summit vent. Eruptive activity continues at moderate levels. There are occasional ash explosions with plumes of a few 100 m height and possibly minor lava effusion from the intra-caldera cone at the summit. Activity remains at high levels, characterized by small explosions and the likely effusion of lava flows. Unfortunately, near-constant cloud cover makes direct observations difficult. Small to moderate explosions and (probably) the effusion of a lava flow on the NE side of the cone continue. Seismic activity is high. - 12 July: so-called drumbeats seismic signal, typical for magma ascent, followed by signals of rockfalls - this is likely the start of the lava flow. The IG reported that in the last few days, increased seismic activity indicative of increased eruptions has been noticed at the volcano. Seismic data also indicated the presence of a lava flow travelling down the SW slope of Reventador's intracaldera cone. An increase in seismic activity has occurred today. 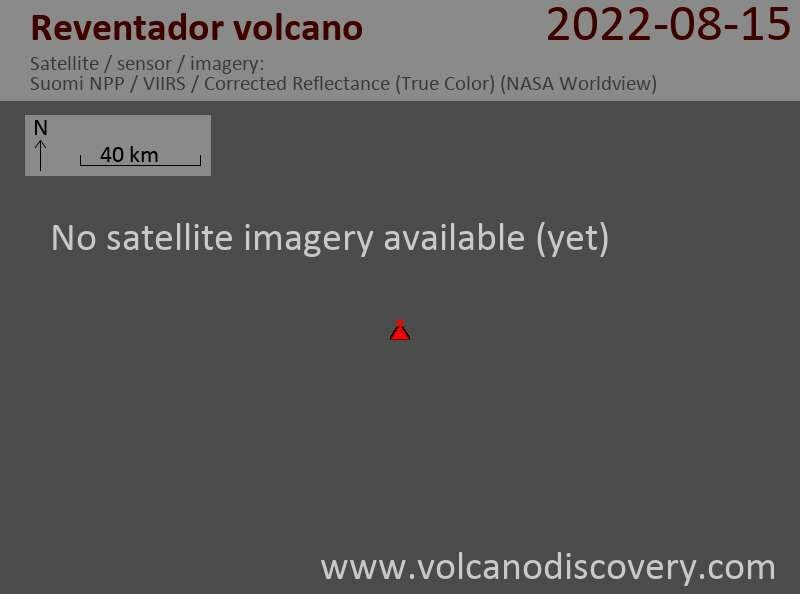 A steam plume can be seen rising above the volcano and a hot spot at the summit continues to be visible on MODIS satellite data, suggesting continuing lava extrusion. IGPEN characterizes the activity as moderate with seismic activity mainly related to internal fluid movements as well weak pulses of tremor and explosion signals. The volcano is hidden in clouds most of the time, but a thermal anomaly has become visible at the summit again on recent MODIS satellite data, possibly related to a recent small effusion of lava there. Weak eruptive activity continues with occasional steam and ash emissions during small explosions that create plumes reaching about 1 km. No significant changes have occurred recently. The volcano remains active at moderate levels and produces a steam plume 800-1000 m high and occasional small explosions. IG reported continued moderate activity with occasional (mostly unobserved) small explosions. Activity has remained moderate with occasional explosions and possibly the emplacement of a hot avalanche or lava flow on the eastern flank, where a new hot spot on the latest MODIS satellite data can be seen, in addition to the summit where a lava dome is active. Last night, emissions of steam and some ash produced a column rising bout 1 km above the crater. Activity remains moderate with frequent small explosions detected on seismic signals and strong degassing producing a plume that was observed yesterday rising 800 m.